Newfreescrensavers.com has created a special page dedicated to London underground: free screensaver, wallpapers, featuring London Tube Map, online game and more (http://newfreescreensavers.com/london-underground-map-pdf-download). London Underground Map page is just the right place for travelers to plan city trips fast and easy around London. This year London is not only the capital of Great Britain, but also the capital of Summer Olympic Games 2012. NewFreeScreensavers.com, a website of free desktop application such as screensavers and wallpapers, has created a special page dedicated to London and London Underground Map. London Underground Map page is very helpful for both Londoners and travelers, those who plan to visit London this summer and be a part of the world greatest sport event, Olympic Games 2012. All desktop applications on this page are created on the bases of London Tube Map: screensavers, wallpapers, online game and even London Underground Map PDF file. Fans of screensavers can download three variants of London Metro Map screensavers and a free wallpaper, which is available in four different resolutions. For example, nfsLondonMetroMap2, a free animated screensaver, features the central lines of London underground map. With stations. Animation: green circles are indicating the stations and sparkling on the lines. 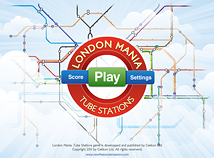 More over a free game London Mania: Tube Stations will help Londoners and London guests to explore Underground of London, learn metro maps of London or check their knowledge of London Metro with fun. The game is available for PC and MAC users, and it is also possible to play online.